Computer Adaptive Testing (CAT) is the new industry-standard in candidate assessment technology, and we are at the forefront. Modern graphics and responsive interfaces keep today’s candidates engaged. Job-relevant graphs, charts and visuals. 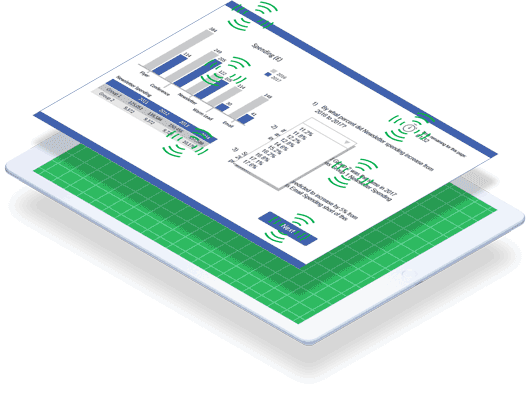 Save time by sifting, sorting, and exporting candidate performance data from within your dashboard, and download PDF reports. Our adaptive algorithm makes sure each candidate sees only questions uniquely matched to their ability for a positive candidate experience. Reliably identify high-performers with up to 90% accuracy. Modern Item Response Theory methods ensure accurate ability measures. All our assessments have been shown to be fair and unbiased towards protected groups. Our tests exceed current psychometric standards. Test Partnership is really easy to use, and feedback from candidates has been great. Getting set up takes less than five minutes and couldn't be simpler. Our system follows an intuitive three step process: create a project; invite candidates; and receive results automatically. The first step is to create a project. This is where you specify which tests you want your candidates to complete. Users can create as many projects as they need, and projects can include any combination of our tests. Projects can be added, edited or removed at any time. Once you have created a project, the next step is to invite your candidates to join it. 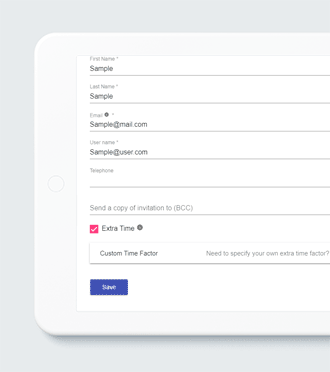 Candidates can be invited individually or in bulk through CSV upload. This can be done with the candidate's name and email address or it can be anonymous. Our system then automatically sends their login details. Once a candidate finishes their tests, you are automatically notified and the results are made available. PDF reports or Excel exports are sent straight to your inbox. Alternatively, you can log in and view the results at any time, on any device and from any location. Over 6000 companies across 40 different contries trust our specialist expertise to deliver robust people performance metrics. Large influencer or small startup; all companies recognise the importance of selecting the best employees and we help you achieve your goals. Using the most respected occupational psychology theory in the industry, our assessments predict the best performing candidates in less time, with more accuracy. Hiring the right people is the most important thing your organisation can do. Our custom view engines have been built to provide ultimate flexibility for every client and every design brief. Boost your employer brand and candidate attraction activities with on-brand customised assessments. 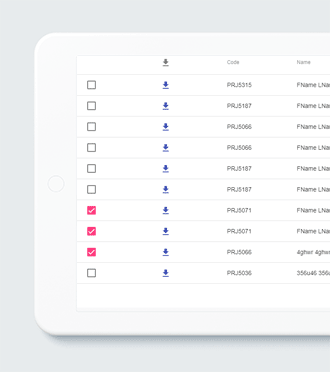 Engage every candidate across any device. Test Partnership have the expertise to customise assessments without compromising on scientific rigour. We integrate with your ATS, CRM, EMS, HRS, or any other software solution. Our software engineers have integrated with some of the biggest ATS providers and we regularly write fresh integrations. We want to make your life easier, and seamless integration is at the heart of this. We’ve developed 12 highly effective off-the-shelf assessments to predict job performance. Numerical test to assess ability to work with numbers. 15 minutes, 15 questions. Designed for all levels. Verbal test to assess ability to work with written information. 15 minutes, 15 questions. Designed for all levels. Modern user interface and graphics library for easy administration and enhanced candidate experience. Our adaptive machine learning algorithm automatically adapts questions to candidate’s ability level. Improved candidate experience and shorter test times. Intelligent timer logic allows for dropped internet and guards against candidate cheating. Option to fully-customise and re-brand assessments to your requirements. Calibrated by tens of thousands of results correlated with job performance predictors. Our team of data scientists, occupational psychologists, and software developers can solve your people performance problems. Large scale graduate attraction and screening solutions. Impress your graduate intake with modern visuals and engaging content, while improving your diversity and quality of hire. For high-stakes selection decisions we blend the most rigorous and face-valid assessments for c-suite buy-in. We work with you to profile and select the best. Our online tests give you detailed aptitude scores and personality profiles for any candidate. Instantly assess candidates to measure their true potential through our easy-to-use online testing platform. The testing process is instant, so you can get started right now. 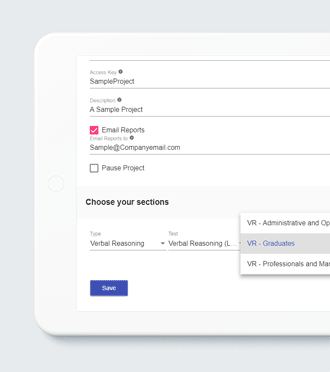 Results are generated automatically and sent to you instantly as candidates complete their assessments. Our detailed psychometric reports provide results summaries and their implications for the workplace in an easily digestible, user friendly way. We are fully trained so you don't have to be. You control which candidate sits what test through your online admin platform and we deal with the rest. You're in safe hands; our experts take care of hundreds of online assessments every week. Our team of occupational psychologists, data scientists and consultants are only ever a click or call away, so there will always be a trained professional at hand to provide you with advice or technical support. Adaptive tests are the future. Personalised, targeted, and fair assessments. Our adaptive algorithm employs scientifically robust methodologies, for reliable, targeted and precise measurement. You can have full confidence in our assessments. Our intuitive dashboard makes it easy to sort, rank, and manage candidates. Tablet and mobile responsive so you have full control wherever you are. Talk to one of our support agents anytime in real-time through live chat. Easily export results to Excel and import candidates from other sources.